by LEO E. LAURENCE, J.D. Firefighters drench the building containing the Obelisk store with water to bring the fire under control and prevent it from spreading to any other buildings on the same block. Photo © 2011 by Leo E. Laurence. 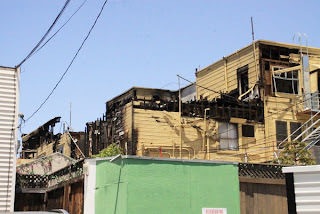 The burned, skeletal remains of the three-story building destroyed in the 3-alarm in Hillcrest July 6th can only be seen from the alley behind the building. Photo © 2011 by Leo E. Laurence. While the carpet in the Obelisk Bookstore was soaked by water, this exclusive photo shows some merchandise almost untouched, except for the intense smell of smoke. Photo © 2011 by Leo E. Laurence. With temperatures over 1000 degrees (F) at the core of the three-alarm blaze that closed three businesses on University Avenue in Hillcrest, including the Obelisk Bookstore, Wednesday, July 6, firefighters were initially pushed back and prevented from fighting the hellishly hot fire inside the building. While a firefighter’s “turnouts” will protect him from most hazards inside a burning building, they cannot withstand a fire blazing at over 1000 degrees. 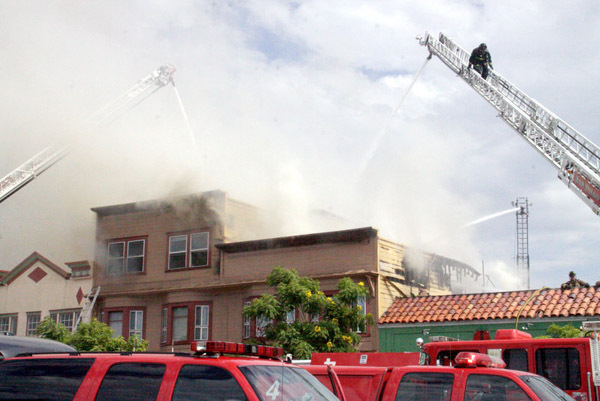 Firefighters had to rely primarily on three ladder trucks to shoot water onto the 100-year-old three-story wooden building. The spectacular fire was reported at 3 p.m. and was still sending large plumes of smoke into the air and neighborhood long into the night. Wind was mostly coming from the north and sending the thick clouds into the residential neighborhood south of University, near Tenth Avenue. Frequently the wind would change and blow the thick cloud of smoke east down University, blinding pedestrians and impeding traffic. The smoke was easily smelled in North Park. The change in the direction of the wind created enormous problems for firefighters, as the wind blew the roaring hot fire towards the neighboring building, taking out two more businesses. Being made of old, dry wood; the worst part of the blaze was in the two stories of studio apart-ments above the three businesses that were destroyed: Torreon Importers, Pomegranate House, and the Obelisk Bookstore. An army of 113 firefighters, including 14 engines and six fire trucks from as far away as Chula Vista and National City, responded. On the two upper floors, 12 of the 15 apartments were occupied. Fortunately, none of the residents were home when the fire struck, so none were killed or hurt. Thousands of gallons of water from the three aerial trucks was pumped onto the unusually hot blaze. At times, water poured out of the windows of the two stories of apartments. With the fire’s intense heat, the third floor collapsed. The fire did not get down to the Obelisk Bookstore, but it sustained extensive water damage. “Everything is wet,” said a contractor the next day at the doorway of the bookstore. Not true. I was refused entry inside the bookstore. But, wearing a shirt and tie and with my SDPD credentials displayed, I got inside and shot photos of lots of merchandise that appeared undamaged by the water, particularly along the walls. I was later told to leave, but I had my photos. While water poured through a large hole in the bookstore’s ceiling, many of the books and calendars appeared unharmed. Water may not have seriously damaged much of the merchandise, but the smell of smoke will reek off everything. A temporary retaining wall has been built down the center of the bookstore to support the ceiling, weakened by the flood of water used to kill the raging blaze. From the street, the extensive fire damage is not so obvious. But as seen from the alley behind the building, the incinerated skeleton of the three-story building looks like a bomb hit it. The bookstore’s phone number has been taken out of service. Frequently, large crowds gather to watch a major three-alarm fire. But the sparse crowd on the north sidewalk of University Avenue created no police problem. When the wind suddenly changed and the thick, wide plume of smoke pouring off the fire enveloped everyone on University Avenue, many watching the fire covered their face with handkerchiefs to breath. They suddenly experienced life for a smoke-eating firefighter. University Avenue at Richmond and 9th Avenue was blocked to cars.